Vampires have been widely mentioned in the history of many cultures like the Mesopotamians, Hebrews, Ancient Greeks, Christianity, and Romans. Generally unknown, India as well had many different vampires and this is because it is a country rich with folklore from thousands of different local customs and religions. In fact, this country probably has more legends of vampires than any other culture. The legends and folklore are still drastically different from city to city, and village to village. The gods that are honored differ depending on what part of India you are in, and there are thousands and thousands of gods to choose from, so does the stories of ancient India, which has as many demons as it has gods. Pishacha – Creatures with their own language! Pishachas are another sort of vampire creature of Hindu lore. They are described as having red, swollen eyes and bulging veins. They are flesh-eating demons, typically associated with being feminine. These creatures are nocturnal, of course. They are said to haunt cremation grounds, like many of the other demonic beings of Hindu lore. They are categorized as being a separate race from humanity. Although humans cannot become or transform into Pishachas, they can be possessed and controlled by one. Pishachas are even believed to have their own language called Paishachi. While some legend has it that Pishacha was created by Brahma himself. Brahma is one of the Hindu Trimurti, and a Creator God, one of the most powerful gods in the Hindu religion. Other legends tell that Pishacha was created from Daksha, who was another Creator in Hindu stories, part of the Prajapati; one of the gods of creation. Another popular legend claims that the Pishacha were the sons of Krodha. The word Krodha means ‘anger’ in Sanskrit and may have related to an actual person or deity at some point. Stories states, Pishachas can change their form, according to some traditions, some accounts also say they have the ability to become invisible. Other accounts say that they can enter the body of living humans, and use them to feed on others or they can create illnesses in those that they possess and make their human hosts go insane. It is believed that anyone who sees a Pishacha is doomed to die within nine months, according to some myths. People from the Hindu traditions do have certain beliefs and methods to drive the demon away. One of the powerful ways of protecting against the Pishacha is to chant certain mantras which can exorcise a person possessed with a Pishacha. It is said that along with mantras, giving offerings and participating in religious rites like the puja can keep a household safe from demons. Pey and Peymakilir – Demons or the Angels of Mercy? This is the vampire which chooses to haunt the wars and battles, waiting to feed on fallen soldiers. These creatures are called the Pey, or Peymakilir, are vampires of southern India, in Tamil. What better place for a bloodthirsty vampire to feed than a battleground? 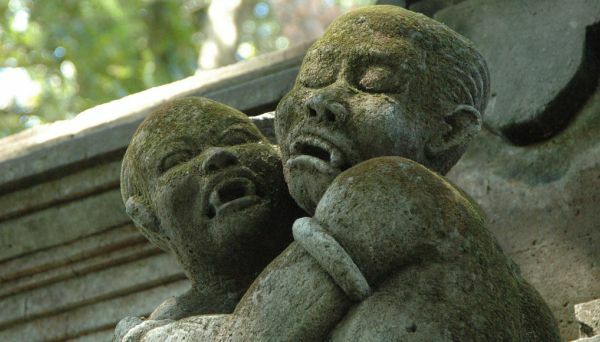 The Tamil people have their own unique language and myths and these Pey and Peymakilir vampires are part of the Hindu mythology in this part of the country. The Pey are vampires of battlegrounds and wars and the Peymakilir is the name for the female incarnation of this vampire, and she does a ritual dance as she devours bloodied corpses. The Peymakilir is quite deadly and fearsome; she dances frenziedly as she tears the flesh off of the still living soldiers on battlefields. The Peymakilir is perhaps more vicious; she prefers to devour the flesh of the dying and dead, while the Pey drinks their blood. Feeding on the blood of fallen soldiers, the soldiers are not always dead when the Pey and Peymakilir vampires begin to feed on them. On the other hand, this may not be as terrible, in another sense, these vampires might be perceived to be angels of mercy. The soldiers may be mortally wounded and dying a slow, agonizing death. The merciful vampires drain them and expedite their journey into the next life. Vetala – A hero in the Disney series! The Vetala is another vampire of India. Also written as ‘Vetaal’, or ‘Baital’, they inhabit the bodies to wreak havoc in the world. Generally, Vetalas stick to occupy the bodies of dead people. However, they can enter living victims as well and manipulate them as they please. They are a class of demons in Hindu mythology that have the power to enter the bodies of human or animal corpses and reanimate them. This myth is also connected with burial rites or, in some cases, the circumstances of a person’s death. It is believed that a body buried improperly without an appropriate funeral is in the danger of becoming possessed by a Vetala. The concepts of Vetala is different than a human just becoming a vampire, after being bitten or getting infected by one or being killed by one. Popularly, vampires we have come to know are still the humans they once were added with some bloodthirsty tendencies. Nevertheless, Vetalas are not like that at all. They are demons with a separate entity that takes the body of a human. The soul of the person whose corpse the vetala is possessing is completely gone. The Vetala demon simply puts on the body of the person like a shell. Harming or damaging the corpse that the Vetala inhabits does nothing to destroy the Vetala. It simply departs from the corpse and finds a new one to inhabit. These corpses do not have the human memories or go after their families and home villages. Being far-off from friendly, they’re one of the most vicious vampires of Indian lore. They take delight in destruction, killing children, causing miscarriages, and driving people insane. Although, in some cases, Vetalas are portrayed in a positive light. For instance, the vetala in the Baital Pachisi is shown as a heroic character who saves the life of the protagonist, the king. Also, there is a series on Disney Channel India called Vicky and Vetaal which is based on the Baital Pachisi story. It features a young boy named Vicky and his friend the vampire Vetaal, who drinks milk and not blood. The two have many adventures, and the Vetaal certainly isn’t portrayed as a malicious demon creature.